Kitchens really are home central — it is where everyone congregates and all the action is. It’s no surprise that kitchens (and baths) tend to be the most expensive spots in the house with all the cabinets, appliances and cool plumbing fixtures, but some careful planning to add popular upgrades will help you budget for them without breaking the bank. Tile has had an explosion in color, texture and pattern. This is a great place to add a lot of character in a kitchen. Full-height backsplashes are a given, but a fully tiled wall is a popular, beautiful and affordable trend that can differentiate your kitchens style from so many others. White subway tile remains a standard, but with a twist of highly contrasted grout. Simplified backsplashes that are all one material are popular and give a clean and cohesive look. Quartz countertops have taken over. The progress in quality of design and texture is amazing in the world of quartz countertops. Some is a bit costlier than granite, but the designs are really stunning and the durability can’t be beat. 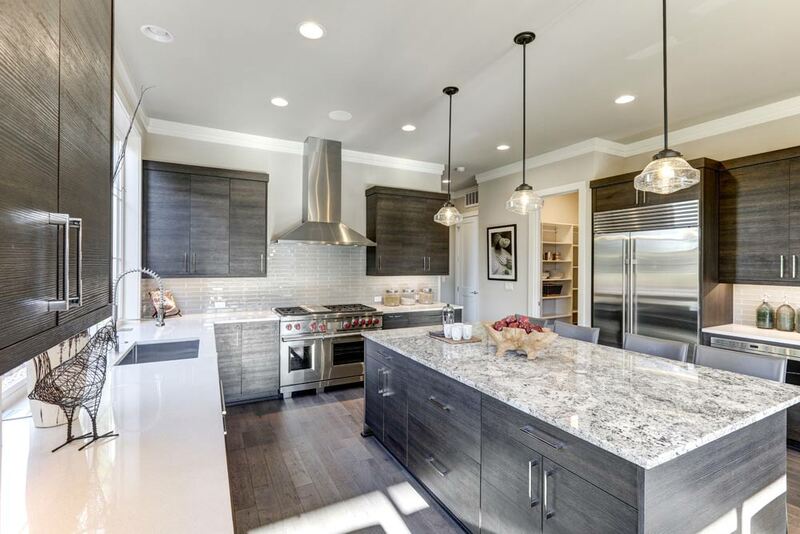 Marbles and stones have been flawlessly mimicked by Cambria, Aurea Stone and more, and don’t have all the sensitives of natural stone, marbles or quartzites. Large — actually, huge — kitchen islands are very popular, 4 to 5 feet wide by 10 feet long. This makes for an incredible workspace, and with jumbo slabs available in quartz, they are easy to do without any seams in the countertop. A waterfall edge is also popular, though a more modern detail, and can really differentiate your kitchen. Organizers and built-ins in cabinets are really popular. Not only do they keep spaces neat, they actually allow you better access and, in most cases, more storage. 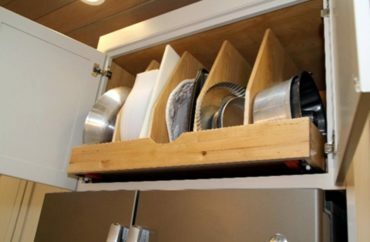 The most popular ones include a roll tray under the kitchen sink to allow full and easy access to the contents, and the cabinet above the refrigerator. Drawer organizers, trash and recycle cabinets — there are so many options to make life easier and a little neater. 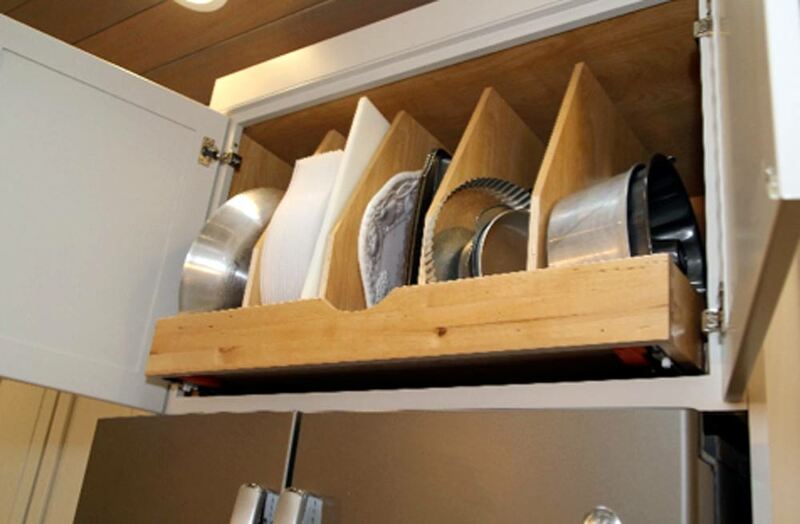 Drawers rule over cabinets these days because they hold just as much with improved access. Plumbing fixtures for the kitchen have had some upgrades too. Both stainless and cast iron are popular, and the farm sink is also a good choice in either material. Air switches are the newest method to operate your disposal, easy to use and right at the sink, no looking around for the light switch! Commercial-style faucets have take a back seat to sleeker but tall faucets with a pullout spout that offers both spray and stream and a button to stop the water flow temporarily. Spot-resistant stainless is available in most brands and remains the top seller in finishes. Painted cabinets in white or white-looking are still leading the pack, along with a shaker door in several variations. A durable, tinted varnish or painted cabinet with a conversion varnish finish will look great for years. Cabinet hardware in all colors, textures and shapes dress up the look and 99 percent of cabinets have hardware added, which helps preserve the finish. Under-cabinet light is considered a must, with clean and bright LED tape light being a top choice. Light rail along the bottom of the cabinet conceals the lighting and wiring and gives a nice detail. Another popular item is the plug strip, which keeps the outlets up underneath the cabinets and not in the middle of the backsplash. Once most people see it, they love it, especially the super-clean look it provides. Top-row cabinets with glass doors, lighted or not, are a popular trend as well. Appliances round out the kitchen and the new slate and black stainless are worth checking out. They have a rich color and don’t smear and smudge like stainless. Most have stainless handles, so they can coordinate with other stainless appliances. 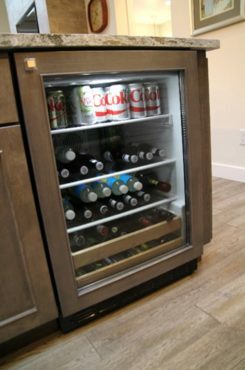 Beverage centers are very popular, whether under-counter or full-height for wine storage. It also helps to keep traffic flow managed better when entertaining and frees up valuable refrigerator space. Counter-depth refrigerators are still most common. Though they have a bit less space for storage, the space they save in the traffic pattern makes all the difference. As much time as you spend in the kitchen, it’s important to really make that space special. 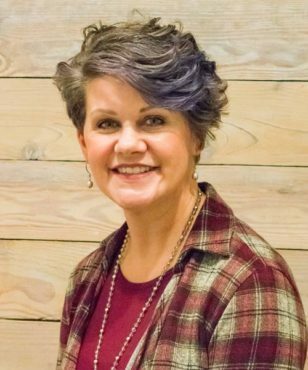 Take the time before building or remodeling to investigate options and costs so you are able to create the kitchen of your dreams.